Mr. Speaker, at the beginning of this week, I didn’t know that today we would wind up at a pivotal point in this Assembly that may determine the future of our consensus style of government. On one hand, the report of the Auditor General of Canada has presented us with concrete evidence of a significant and unacceptable failure on the part of the government, under the watch of, seemingly, the most competent Minister in this Cabinet. We have also been faced with a shipping fiasco for which no one is taking responsibility. Further, the questioning of multiple Ministers this week has left many with the impression that Cabinet either does not respect the role of the Regular Members, or does not understand consensus government. On the other hand, the Member for Kam Lake has indicated that he will bring forward legislation to officially bring political parties into this legislature and allow those parties to spend money promoting candidates in excess of what independent candidates can spend. Passage of these changes would signal the end of our style of government. The question is: is consensus government worth saving? We are faced with a situation where a lack of action means a lack of accountability, and it is putting our system to the test. I will have questions for the Premier about whether he will keep his Ministers accountable or if we have to do it for him. Thank you, Mr. Speaker. MR. SIMPSON: Mr. Speaker, I believe in consensus governments, and after working in the system, I know that the grass is greener on this side of the fence. Of course, there is always room for improvement. In order for our system to function, strong leadership is required. Now is the time for that leadership. The Premier has quite broad powers, greater than most people realize, I believe, and with that comes a great responsibility. Every time I go into his office, I feel like Luca Brasi in the beginning of The Godfather, so I’m sure he’s firmly in control of his Cabinet. I want to ask the Premier: this House has made clear that it will not tolerate an acceptance of the failure outlined in the Auditor General’s report on Child and Family Services. What is the Premier going to do about this? Thank you, Mr. Speaker. MR. SPEAKER: Masi. The Honourable Premier. HON. BOB MCLEOD: Thank you, Mr. Speaker. First of all, I want to say that I’m very concerned about the Auditor General’s findings that there are serious deficiencies in the delivery of child and family services, but that’s not news to me. I have been involved at a national level working with the Council of Federation with the premiers, and every jurisdiction in Canada has serious deficiencies in delivery of child and family services. I also chair the Aboriginal Affairs Working Group where Minister Abernethy and I led a review of best practices in childcare in all of the provinces and territories and we tabled a report, but that does not denigrate from the findings of the Auditor General. In my situation, I have to find out the seriousness of the matter. It’s very serious. I read the Auditor General’s report. The methodology that they used, they have reviewed 37 child files and 37 foster care files. They also said that the department provides protective and preventative services to over 1,000 children a year on average over the past 10 years. To me, one child in care that’s not dealt with properly or who doesn’t receive the proper care or protective care is an emergency. I have to deal with becoming more involved with the file. As the Member said, I have some powers. 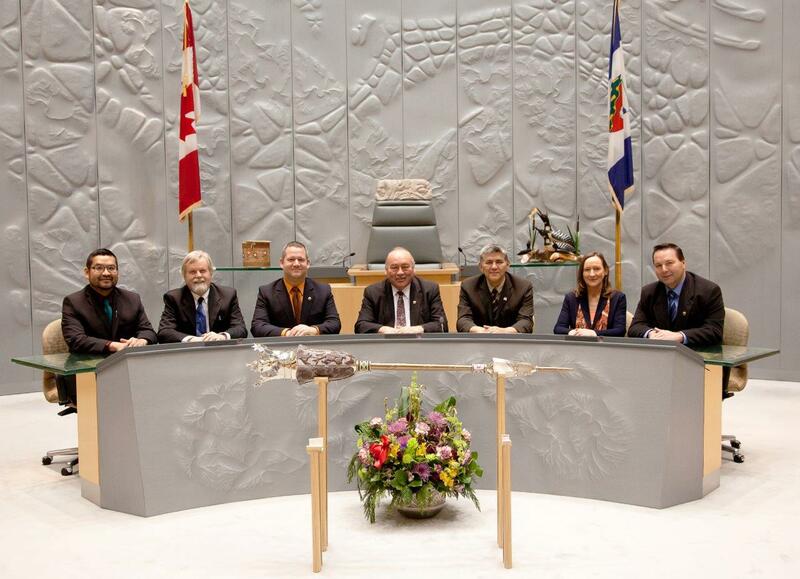 The Legislative Assembly appoints the Ministers. I issue the portfolios. I have a couple of options. Before we get to those options, Members can speak to the Minister or we can have what we call “fire side chats,” which in the past have proven very beneficial in improving our government’s performance. If there are still concerns about the Minister’s performance, as I said, I have two options. Either a Cabinet shuffle or one that we take very seriously and is a more serious is the removal of a Minister’s portfolio. I have reviewed the actions. I have looked at the report. It’s a very serious situation. I believe that and I’m satisfied that the Minister has taken this issue seriously. It’s very important for the public to know that this government is taken seriously. I’m waiting for my friend, the Auditor General of Canada, Michael Ferguson, to come on December 12. I would like to discuss it in more detail because I don’t know. I understood we dealt with the 2014 auditor in good faith, where we put in a foundation, and now for the report to come back and say, “Well, you know, you’re worse off than you were before,” I’m wondering what happened to their previous audit. I need more information. I know this is very serious. It’s a very serious concern, and we are not going to take it lightly. Thank you, Mr. Speaker. MR. SIMPSON: I would like the Premier to harken back to his days as a deputy minister and maybe bring that iron fist out again to handle this situation because it is serious. The concerns of the public and Members of this House regarding issues with MTS had been shrugged off by the Minister of Infrastructure, and his responses have been defiant to the authority of this Assembly. It’s clear to anyone who pays attention that the Members on this side of the House consider that behaviour unacceptable. I know that the Premier has been watching every day that we are in the House. He sees what we see. What is the Premier doing to handle this situation? HON. BOB MCLEOD: We knew when we got into the situation of operating a barging company that there would be some serious issues. It is a very challenging environment to operate in, and we recognized that there would be situations where we would not be able to make deliveries. We have put in place a revolving fund, which allows us to try to make the three communities as whole as possible, even the communities that not in the Northwest Territories, and we are spending approximately $3- to $4-million to try to deliver all of the fuel that the community needs. Of course, that is a top priority. We also will be delivering the food and goods that they had purchased, and some we just can’t afford to deliver, such as vehicles and so on. That is the responsibility we have taken on ourselves. As far as the operations of the barges, and I understand that there was fuel that wasn’t up to spec, we will examine all of those in the normal course of operations, like we do in every operational situation, and we will take steps to try to make sure that it doesn’t happen again. There have been suggestions that perhaps somebody was asleep at the wheel. If that was the case, we will find that out as well. Right now, our priority is we have to get fuel into the communities. We don’t want the communities to freeze up. We want customers to get their food and so on, and we will continue to operate on that basis. MR. SIMPSON: Mr. Speaker, my questions are more about what the Premier is going to do to get his Cabinet in line. It’s clear that the Members of this House are not happy with some of the results that are being produced, the way that Cabinet is answering questions, and the way that they view the Regular Members. I am not here to do the Premier’s job for him, but I think he needs to sit down with the Ministers who everyone knows are causing some issues and make them realize that we are here to serve the people, that the questions coming from this side of the House are coming from the public, that we ask them for the greater good, and that defiant answers and refusals to answer questions and share information and work with the Regular Members is not appropriate. Will the Premier sit down with his Cabinet colleagues and put them in place for us? HON. BOB MCLEOD: In my view, in my estimation, that is what we should all aspire to and certainly will have discussions with all of the Members of Cabinet as we want to do. I think that is why I have relied on fireside chats, to try to make sure that we are all working, pulling in the same direction, and I find that when we treat each other with respect and when we work together, we accomplish a lot more. I certainly thank the Member for bringing this to our attention again, and it is important for us to continue to pay a lot of attention to it and continue to aspire to improve in those areas. MR. SIMPSON: Thank you, Mr. Speaker. Like I said, I was hoping he would bring up the old deputy minister iron fist, but I didn’t hear that. The fireside chats are great, and I admit that we haven’t had enough of them. I brought this up before at the mid-terms, but the phones work both ways, and just like I can walk down the Cabinet hallway; the Premier can walk down our hallway. He knows the issues. Will the Premier commit to reaching out more to the Regular Members so that we can build a better relationship with Cabinet and work better for the people of the Northwest Territories? Thank you, Mr. Speaker. HON. BOB MCLEOD: Certainly I will endeavour to do that, and the deputy iron fist, perhaps that was the good old days, but certainly I will continue to work very closely with the Ministers to continue to work to deliver on behalf of all of the Members and also to serve the people of the Northwest Territories. We always aspire to get better. Thank you, Mr. Speaker.